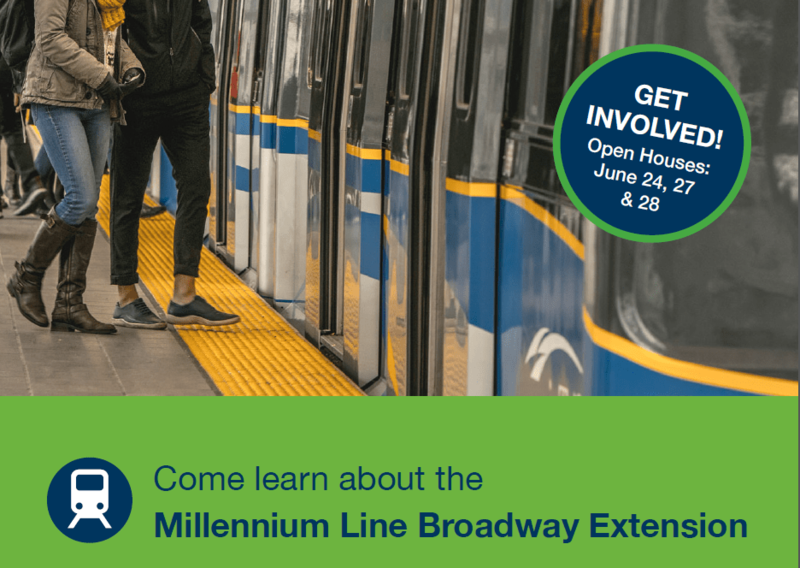 You’re invited to pop by an open house to learn more about the Broadway Extension and share your thoughts. Today (June 19), we’re launching our next round of consultation, in partnership with the City of Vancouver. Back in January 2017, we launched the first phase of consultation and we heard from more than 470 people at in-person events and 4,200 people through our online survey and feedback forms. Now it’s your turn! First Surrey now Broadway – the first phase of 10-Year Vision is allowing us to kick off some major (and much needed) transit projects in Metro Vancouver! Are you looking to be a part of the planning phases of the Millennium Line’s Broadway extension? Then you’ve come to the right place! 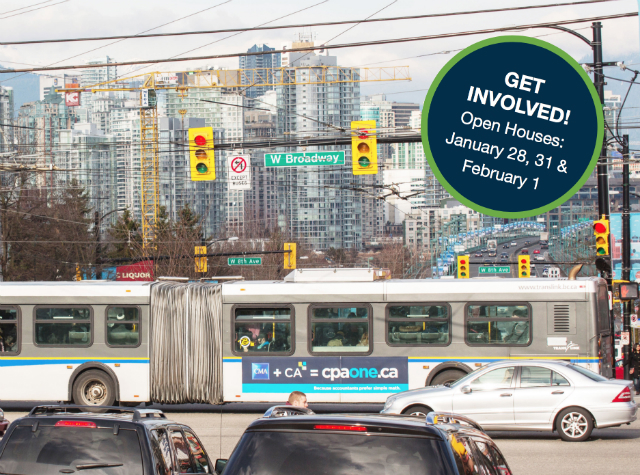 We’ve got three drop-in open houses for you hosted by TransLink and the City of Vancouver. For more information, email broadwayextension@translink.ca. Click here for more information on all TransLink’s rapid transit projects. New Pattullo Bridge consultations – get involved! Just a quick reminder that starting this Monday, June 13, 2016 TransLink is reaching out to you, the public, for your input on the Pattullo Bridge replacement. There are both public open houses as well as small group meetings you can attend to learn more and have your voice heard! These are drop-in sessions and no RSVP or registration is required. If you’d like to attend one of our small group meetings, please register by emailing pattulloreplacement@translink.ca because space is limited! You can also find these events listed in our calendar. For more information on the replacement project and informations sessions, visit translink.ca/pattulloreplacement. 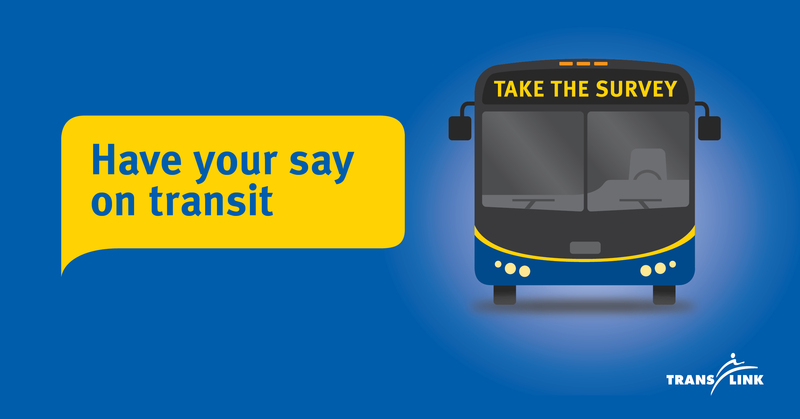 Starting October 13, 2015 you’re invited to take part in an online survey and provide feedback on more than 85 proposed transit changes across Metro Vancouver. We’re asking for feedback now, so we can consider your input as we plan for the future. The survey is available until November 6, 2015. Check out all the details on specific proposals today! For all our savvy followers who participated in previous consultations you might recognize some of these proposed changes from the Downtown Bus Service Review, Northeast Sector Area Transit Plan, North Shore Area Transit Plan or South of Fraser Area Transit Plan. Joyce–Collingwood Station serves a high-density, mixed-use neighbourhood and is an important bus transfer location. As the number of passengers using the station grows, the station will need upgrades that increase passenger capacity and improve accessibility. An information session for the upgrades is being held on Dec. 1. 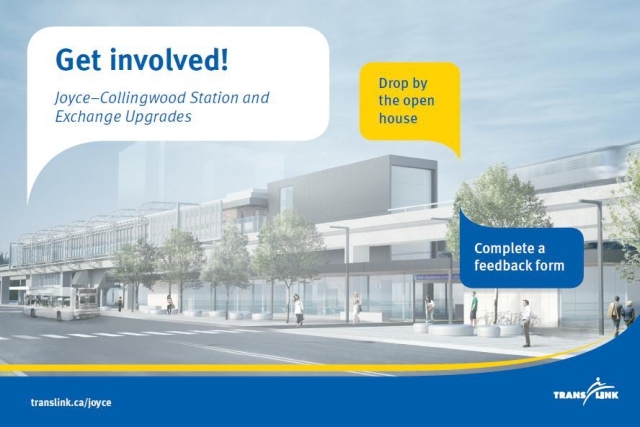 Drop by the open house to learn about the upcoming station upgrades and provide input into the long-term vision for Joyce–Collingwood Station and Exchange. Time: 2:30 p.m. – 6:30 p.m.
Can’t make it to one of the sessions No problem! We will also have information and a feedback survey posted at translink.ca/joyce beginning Dec.1. Regular readers of the blog and those just generally interested in the infrastructure of the region will know the Pattullo Bridge has reached the end its life cycle and that next steps need to be taken. Following our consultation we did last year, the Pattullo Bridge review consultation starts today and runs until June 28, 2013. 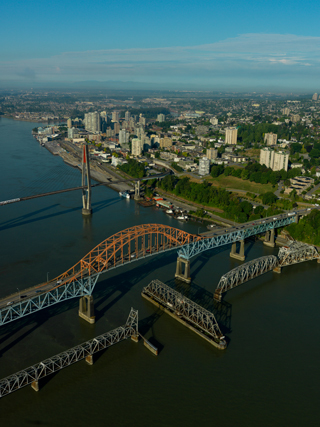 In short, TransLink, the City of New Westminster and the City of Surrey are working together to review and evaluate alternatives to rehabilitate or replace the Pattullo Bridge and to determine a preferred alternative that meets the needs of communities connected by the bridge, as well as the broader region served by the bridge. Read the discussion guide and feedback form. Complete the online feedback form. Visit the Pattullo Bridge Review on PlaceSpeak or the City of Surrey on City Speaks. Send a written submission to info@pattullobridgereview.ca or PO Box 2225, Vancouver Main, Vancouver, B.C. V6B 3W2. There are small meetings today, June 6 and June 19. You’ll need to register here. So, lots of ways to learn and communicate about the Pattullo. This process is moving forward and we’re glad to help facilitate it! A detail from the cover of our 2013 draft supplemental plan. Heads up: TransLink has put together a draft supplemental plan for 2013, to remove a time-limited property tax that is part of our current funding. Feel free to read through the draft plan now—and head to that same link from March 1 to March 15, 2013 to share your comments on the plan. Tell your friends! So why are we doing this? In 2011, the Mayors’ Council approved a two-year, time-limited property tax until a new, sustainable funding source could be found. This tax was part of our Moving Forward work plan for 2012 onward. However, a new funding source was not identified and the Mayors’ Council has signaled to TransLink that they don’t want the time-limited property tax implemented in its setead. We’re responding to the Mayors’ request by putting forward a supplemental plan, which removes the time-limited property tax assumed in the 2013 base plan. The supplement plan will address the removal of $60 million in total in 2013 and 2014. As well, to remove the property tax from being drawn in 2013, the supplemental plan must be prepared by March 31, 2013 and approved by the Mayors’ Council before May 1, 2013. What are the impacts of removing this tax? Without this additional funding, will my service be impacted? We have been focused on operating efficiently and cutting costs. This has allowed TransLink to remove the time-limited property tax while maintaining existing services and implementing the projects outlined in the 2013 Base Plan. However, we will not be able to further expand the system at this time and will need to continue to manage ongoing financial risk. To back it up all the way: a supplemental plan has to do with how we develop our work plans every year. First, by law, we are required to come up with a base plan every year, outlining our work for the next three years, plus an outlook on services for the next seven years. In this plan, we have to describe exactly how we’ll pay for the work we’re planning to do and where the money will come from—which is why funding sources like property tax and such keep coming up year to year. However, if we want to change something about this base plan—to expand, for example, or to change our funding sources—the law says we need to come up with a supplemental plan to amend the base plan. This supplemental plan then must be approved by our Board, reported on by the Regional Transportation Commissioner, and approved by the Mayors’ Council. And of course, there’s more on this on the main Supplemental Plan page. Your feedback is next! Give us your feedback on the plan, then we’ll incorporate it into the plan and present it to the Mayors’ Council in late March. It’s up to the mayors then to decide whether to approve or not. I’ll have more info as it comes! Feel free to ask questions below. Heads up: our 2013 base plan consultation ends today, Oct 12, at noon! The consultation on our 2013 base transportation plan ends today, Friday October 12, at noon! So if you haven’t entered your feedback in our online questionnaire yet, get cracking! We want your thoughts! 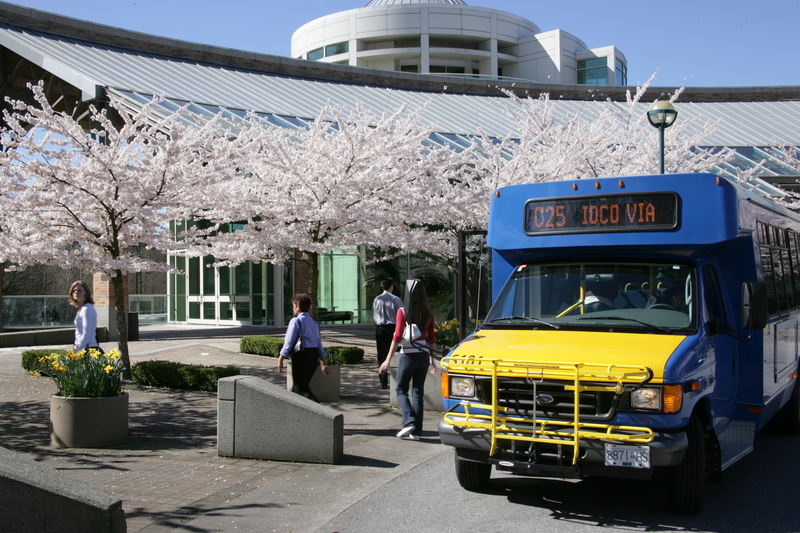 TransLink’s Regional Transportation Commissioner is seeking feedback on the proposed fare increases for 2013. Visit the Commission’s website to find out how to share your feedback on the proposed fare increases. If you’re curious, the Regional Transportation Commissioner plays an independent advisory and approval role in our governance structure. Here’s a diagram showing how his role relates to the governance of TransLink. If you hadn’t heard yet, TransLink’s Regional Transportation Commissioner is seeking feedback on the proposed fare increases for April 2010. Visit the Commission’s website to find out how to share your feedback on the proposed YVR AddFare and the proposed fare increases. If you’re curious, the Regional Transportation Commissioner plays an independent advisory and approval role in our governance structure. Here’s a diagram showing how his role relates to the Board and others.